Being the daughter of a Free Methodist minister and a teacher gave direction to Lenore’s professional career. After receiving a bachelor’s degree in Christian education and an M.Div. 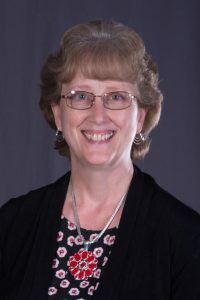 from Asbury Theological Seminary, she served in church ministry at the local, conference and general church levels, taught at her alma mater, and homeschooled their two sons. Over the years she has also done office work. This led her to the Free Methodist Church of Canada headquarters where she held the positions of personal secretary to the bishop, assistant to the Executive Director, and office manager. Lenore brought these skills to Asbury, working first as Presidential Search Assistant, then as Admissions Assistant in Graduate Education, Academics Records Specialist in the Registrar’s Office, and Staff Assistant in Institutional Development. As the Administrative Assistant to the Vice President for Institutional Advancement, Lenore’s main responsibilities include supporting the Vice President in his daily work and overseeing the administration of matured bequests and estate gifts. She takes joy in serving alongside her coworkers to assist constituents. Lenore and her husband, Don, have two sons, Andrew ’13 and Aaron ’16, ’18 M.S.W., a daughter-in-law, Sara Antonetti ’12 Sweigard, and a grandson who is sure to be a future Asburian. In her free time, Lenore finds pleasure in caring for her family and home, travelling when the opportunity arises, and studying Hebrew.